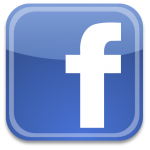 NC DNA Day 5K on Facebook! 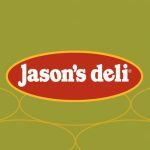 In-person registration is available during packet pickup at Fleet Feet in Carrboro and on race day at the registration tent. 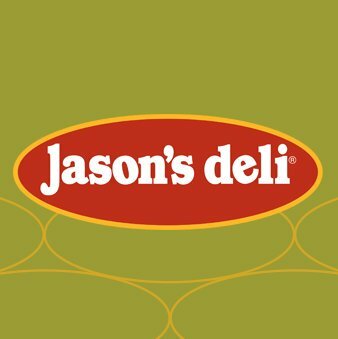 Only cash or check will be accepted on race day, although ATMs are conveniently located near the registration tent. Student Registration ($25): Discounted student rates are valid online at the link above. Students must show a valid student ID when picking up your packet. High school students without student ID can also register for the discounted price. 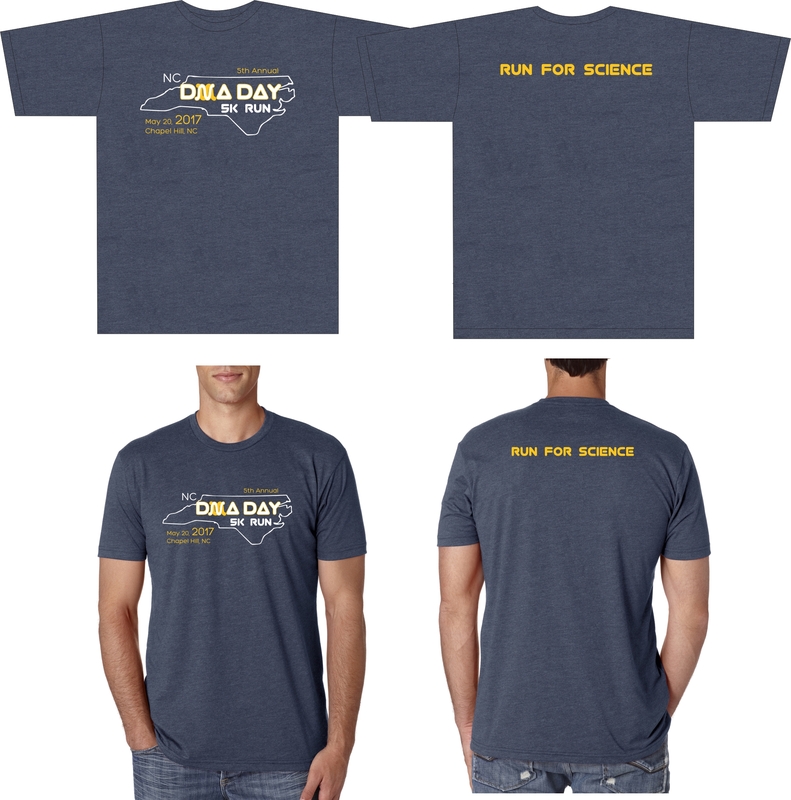 Registration includes DNA Day 5K T-shirt. Non-Student Registration ($30): Discounted rates available through the registration link above. Registration includes DNA Day 5K T-shirt. Kids Fun Run ($5): Online or in person registration ($5) includes science themed medal! In Person Registration ($35): available May 18th during packet pickup (see below) and on race day (May 19th) beginning at 6:30am. Donation only: If you’d like to make a direct contribution to support NC DNA Day, please GO HERE! Make an individual donation or support an existing fundraising team. Donations of at least $25 will be listed on the NC DNA Day website and will be announced on race day. Your donations are tax deductible (Federal tax ID number: 56-6001393), and all proceeds support NC DNA Day and science outreach in North Carolina. THANK YOU! 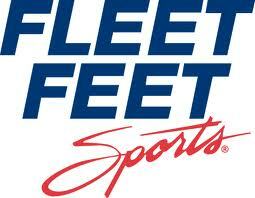 Packet pickup will be on Friday, May 17 at Fleet Feet in Carrboro from 3-7 pm. 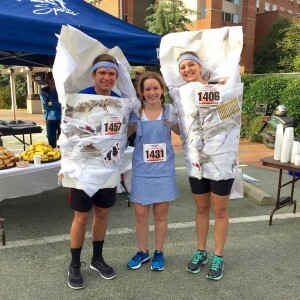 Packets will also be available on race morning at the race tent on UNC Chapel Hill campus starting at 6:30am. To expedite the pickup process, we STRONGLY encourage runners to pick up their packets and shirts in advance on Friday at Fleet Feet in Carrboro. Refunds and Transfer Policy: All registration fees are non-refundable. Event registrations are non-transferable between individuals, events, or years. Start time: 8:00am on Saturday, May 18, 2019. Line up location: UNC Campus, Old Well. Cameron Avenue. Recommended parking in the Cobb Parking Deck. Runners are asked to begin lining up behind the start line at 7:45am. Important race announcements will be made at 7:50am and the race will start on time at 8:00am. Kids Fun Run: We will have a special run for kids (ages 12 and under). Parents are welcome to walk/run with your child. Line-up for the kids run will begin at 8:45am. Distance will be a 100 meter dash. Finisher medals for all kids! Chip Timing: Each registered runner will receive a bib with timing chip that will record their official time. 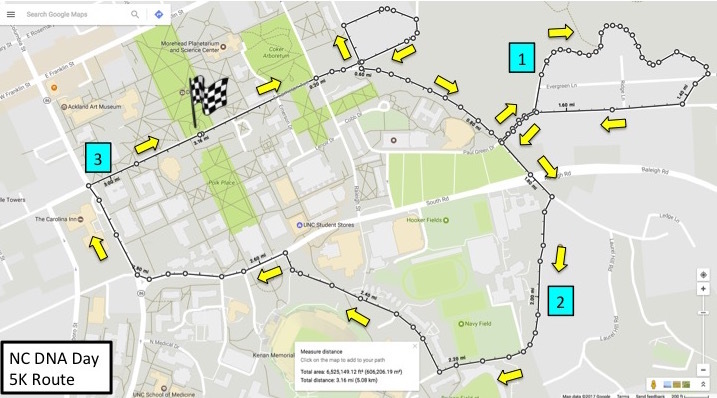 Parking: Free parking is available on UNC Campus in close proximity to the start location. Please see the list below for more specific parking locations. Coming soon! For now, feast your eyes on a previous year’s shirts! This year’s shirt will be similar but a different color. Every registered participant will receive a t-shirt. Shirts are ordered based on the sizes indicated during online registration. To guarantee a shirt in a requested size, you must register by April 15. Cool prizes will be given to winner from each category! Claiming awards: Runners will be able to claim their awards at the Awards Ceremony to be held near the start/finish line at 9:00 am. We do NOT ship unclaimed awards, but they can be picked up by emailing race coordinator, Jeff Steinbach. Here’s a great opportunity to help runners successfully cross the finish line at the NC DNA Day 5K. Our volunteers are the most important factor in truly making this event possible. Be part of the fun and help support science outreach and education in North Carolina! 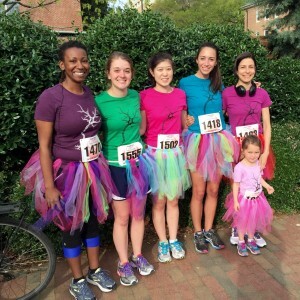 If you’re interested in volunteering on race day, sign up here! Volunteer Training: All volunteers are required to attend the pre-race training session that will occur at 7 AM on race day. The meeting will be held at the Campus Y building across from the old well. Important Reminder: Volunteers are the most important part of a well-organized and successful event. Every little task and detail is important to the overall athlete experience. The day, time of day, and activity that you help with is very important. Please don’t sign up to volunteer unless you are sure you will be able to attend. Each person has an intricate role and no-shows can cause great difficulties for the execution stage of the race. We ask that you report on time and stay on task for the duration of your shift. If you’d like to make a direct contribution to support NC DNA Day, please GO HERE! Make an individual donation or support an existing fundraising team. Donations of at least $25 will be listed on the NC DNA Day website and will be announced on race day. Your donations to NC DNA Day are tax deductible (Federal tax ID number: 56-6001393), and all proceeds support NC DNA Day and science outreach in North Carolina. THANK YOU!